Taste test: These chips were smothered in dill pickle flavoring, making them very speckled with green flakes. The chips themselves were unremarkable. You can taste the pickle, though it was not as good as other pickle chips we've tried. 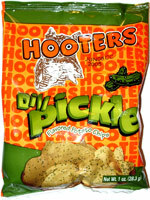 These are also saltier than normal pickle chips. Not a bad chip, but not outstanding either. Smell test: Smells like the inside of a bag of chips, no pickle smell. This snack was discovered by Keith at Denver Airport. Review published .